After the chaos of the bank holiday weekend, we take a moment to catch up with Crew Member Steve. So, Steve, how long have you been on the Crew? I’ve been on the Crew for a couple of years now. I started as shore crew initially, but after six months or so was invited to join the boat crew. Do you have a nautical background? Yes, I do. My family are all keen sailors and I’ve been on the water since I was a baby. I worked as a sailing instructor when I was younger and now work for the harbour master here, helping to make sure that everything runs smoothly. That sounds like quite a fun job. Oh, it is. I really love doing what I do. But it would be nice to be able to average things out across the year. We’re really quiet in the winter and then things go absolutely nuts in the summer when all of the tourists and visiting yachts arrive. My nine to five job quickly becomes a round-the-clock marathon. But I get paid by the hour, so I suppose I really shouldn’t grumble. And then you’re on the lifeboat crew, too. Doesn’t it all get a bit much? Not at all. We have a fair number of shouts, especially during the summer period, but it’s just what I do. Despite the massive inflow of tourists in the summer, the actual community here is really tight knit and we all look out for each other. To be honest, when the opportunity arose to volunteer at the station, I didn’t give it a second thought. I just signed up and took it from there. What’s the best thing about being on the Crew? It’s definitely the sheer glamour of it all! [We have to stop the interview briefly here as Steve descends into uncontrollable giggles.] Er, no. Sorry. Actually, there’s very little glamour, I’m afraid. The best thing, though, is definitely the sense of camaraderie among the crew. And not just the boat crew, but the shore crew, the Lifeboat Management Group, the fundraisers and everyone else who helps to keep the station up and running. What does it feel like when your pager goes off? Let’s be honest, it’s a massive adrenaline rush. But it’s become much more of an automatic reaction now. I just stop whatever I’m doing, make sure I’m leaving everything safely, and get to the lifeboat station as quickly as I can. My family and colleagues all know the deal and they’re very supportive. I suppose the thing that flashes through my mind is that I never know whether I’ll be gone for just a few minutes or several hours. What’s it like being on a longer shout? It depends on why it’s a longer shout. It might be that the casualty is quite a long way out to sea, in which case we spend a lot of time in our seats, planning what we’ll do when we get there, or towing someone back in. Or it might be a long, drawn-out search for a missing kayaker or something like that, which takes its toll both physically and mentally. I’d say that the initial adrenaline buzz from the pager alert gets you through the first thirty minutes of any shout, but it’s the team spirit among the crew that get’s you through the rest. And finally, what’s this I hear about you and Crew Member Susie. Are you an item? Ah. Erm. [Steve blushes the same colour as his lifejacket.] I don’t know what you’re talking about. Erm. What? Sorry, no idea what you mean. Beep beep beep. Oh, gosh. Is that my pager? No, that was you saying ‘beep beep beep’. What? No. Sorry, I’ve got to go. Erm, yes. Gotta go. Really sorry. Er, bye. 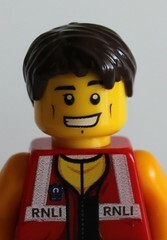 This entry was posted in Interview with the Crew and tagged Crew Member Steve, Interview, Lifeboats, RNLI, The Lifeboat Crew by Simon Perks. Bookmark the permalink.